I love squash especially the one with dark green exterior with deep yellow flesh known as “calabaza” (“kalabasa” in Philippines). Another Asian variety similar in appearance to calabaza is Japanese pumpkin or “kabocha”. Both types of squash are rich in nutrients most notably Vitamin A, potassium, and Vitamin C. The flesh is smooth and sweet and the skin is edible too, though some people prefer to peel it before cooking. Kalabasa is one of the few vegetables that appeal to my family’s taste. I have picky eaters but when I make squash fritters, I don’t expect any leftovers. It’s a simple and inexpensive dish that’s perfect as appetizers or snacks. The sweetness from the squash is balanced with the saltiness of the shrimp paste. I adapted this recipe from my mom. The ingredients are the same except that her squash okoys are shaped like meatballs. I prefer to make my version as fritters just because I like the extra crispiness. 1. Wash squash in cold water and pat dry with a towel. Remove seeds using a spoon then slice them into big chunks easy enough to hold for shredding. 2. Shred squash using a vegetable shredder and place in a large mixing bowl. 3. Add the rest of the ingredients into the bowl: flour, water, eggs, bagoong, and ground black pepper. Mix everything together until well-combined. 4. Heat the oil in a frying pan on medium high. 5. Scoop about ¼ cup of the mixture onto the frying pan and flatten with a kitchen turner. Fry until edges turn brown, about a minute. Flip to fry the other side until golden brown as well. 6. Transfer fried squash fritters onto a plate lined with paper towels to drain excess oil. Repeat step 5 until you used up all the mixture. 7. Serve with some ketchup or sweet sour sauce. 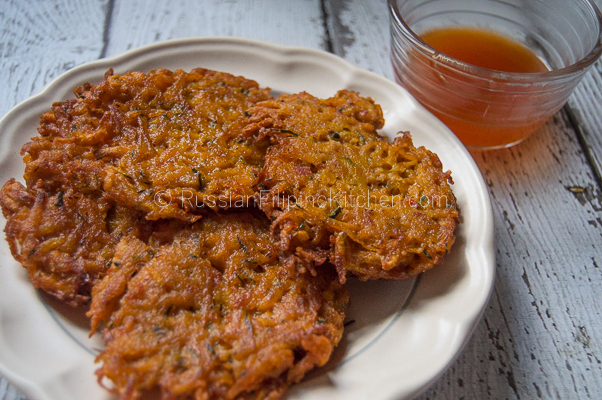 A quick recipe for making delicious and crispy Filipino style squash fritters or squash okoy. Wash squash in cold water and pat dry with a towel. Remove seeds using a spoon then slice them into big chunks easy enough to hold for shredding. Shred squash using a vegetable shredder and place in a large mixing bowl. Add the rest of the ingredients into the bowl: flour, water, eggs, bagoong, and ground black pepper. Mix everything together until well-combined. Heat the oil in a frying pan on medium high. Scoop about ¼ cup of the mixture onto the frying pan and flatten with a kitchen turner. Fry until edges turn brown, about a minute. Flip to fry the other side until golden brown as well. Transfer fried squash fritters onto a plate lined with paper towels to drain excess oil. Repeat step 5 until you used up all the mixture. Serve with some ketchup or sweet sour sauce.